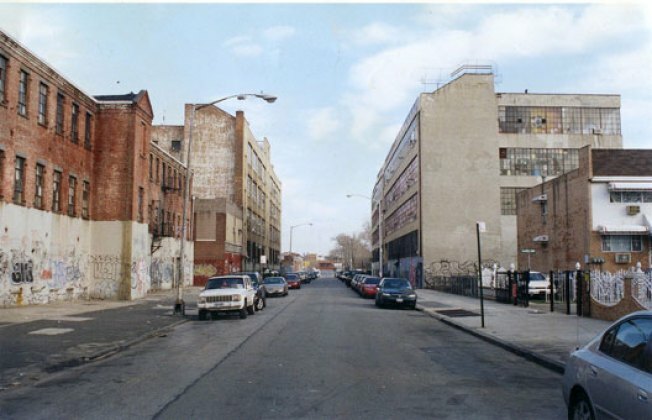 Bushwick's McKibbin Street, circa 2002. There is one neighborhood that has stirred up some mixed reviews amid the recession -- as Bushwick ushers in a wine shop and other trendy retail. Its neighbor, hipster-darling Williamsburg, has been plagued by half-constructed buildings and recession specials, but somehow Bushwick has been home to some brave -- and curious -- development. The new scenery is creeping up alongside older buildings in mostly industrial landscapes. The shops, including an organic grocery and a wine shop, might not be complete misfits, however. Is Bushwick now, officially, the next stop on the hipster train? Just stops east on L from Williamsburg, only time can tell if gentrification has taken hold in the Brooklyn neighborhood. However, one thing is clear, even as rents drop in Williamsburg, some of the nabe's residents are running to Bushwick for dear life, which in New York terms, means finding cheaper rent. Edward T. McLaughlin, a broker who specializes in Bushwick, told the New York Times it is “still maybe five—plus years from getting a Starbucks.” But then again, who cares? Dunkin Donuts’ is better anyway. It will undoubtedly be a long road until the neighborhood reaches its full potential transformation, but in this economy everyone’s mind is open. Living in this diverse community has one definite perk: a good variety of food. Besides, those NYU graduates who camped out in tents in B'wick have found the area to be very liberating.